Before we got a mini pig, I read about Spoiled Pig Syndrome and was determined to not spoil Oscar. Then we brought him home and I realized very quickly how difficult it is to not spoil mini pigs. When pigs first come home, they are often scared and slow to adjust, so pig parents have to focus on making them comfortable and work toward bonding with them. This requires a ton of attention and affection. In the beginning, focusing so much on them is necessary because we want them to feel safe and happy in their new home. It can be really challenging to not spoil mini pigs. Even once they’ve adjusted, mini pigs are so cute and curious that we want to continue giving them our attention and affection. Even on a challenging day with a piglet, it’s hard to resist their cuddles and little grunts. Also, they seem so happy with each bite of food they get, we shower them with treats and watch as they adorably smack and enjoy every single bite. By the time our mini pigs are a few months old, we’re aware that they are spoiled but it’s hard to stop. These pigs have a way of wiggling themselves deep into our hearts, and we so badly want them to be happy. When Oscar is content, I feel like I have done my job as a pig parent and, when he isn’t, I stress about what I’m doing wrong. Am I not giving him enough love? Does he need more treats? Does he need more rooting and outdoor time to just be a pig? Maybe more play or toys is the answer. Maybe it’s more cuddle time that will make him happier. I try to make more time to focus on him and go through my mental checklist of what he needs to be a happier pig. Typically, my answer is to spoil him more. I give him more attention and more affection hoping that he’ll love and respect me more. Then, when that doesn’t work, I get frustrated and angry. I try to write this blog based solely on my experiences as a mini pig owner and, in case I’ve ever given off the impression that I’m an expert, let me be the first to tell you that I’m not. I’m still learning and going through all of these new experiences as a pig parent, and some days are amazing and other days are really tough. This week, I had a completely new experience of learning the realities of Spoiled Pig Syndrome. Like many mini pig parents, I often joke and laugh about how spoiled Oscar is. In some cases, it is funny. Similar to so many other pampered house pigs, Oscar has his humans trained ridiculously well. We want so badly to make him happy, and we spend a ton of time and energy on giving him a good life. But, while it’s not uncommon to joke about mini pigs having Spoiled Pig Syndrome, the reality of it is not as humorous. Last weekend, Oscar’s attitude was getting out of control. He was snipping at everyone in the house, including the dog, growling, and head swiping. When we went to move him after a nap, he tried to bite us several times. We even saw the first signs of him charging at us when we attempted to bring him back in from rooting outside. When we grabbed his leash and started toward the house, he would charge at our feet and then act as if he was going to bite us. In one of the worst moments, he was playing with the sandal on my foot like he always does and then just bit my foot out of nowhere. By the end of the weekend, my husband and I were extremely frustrated and wondering what to do. On Monday morning, I decided maybe Oscar wasn’t getting enough direct attention. I have been making sure that he gets plenty of outside rooting time and he always gets cuddle time at night, but I thought maybe he needed more attention during the day. So, I tried getting on the floor with him where he was napping and, when I went to pet his head, he growled, whipped his head at me, and then ran off. I felt like he hated me and didn’t even want me near him. I’ve mentioned before that owning a mini pig can be heartbreaking, and this was one of those moments. After that incident Monday morning, I was wondering how I was going to deal with Oscar as he continues to grow and become more aggressive. He didn’t seem happy and definitely not grateful or content, despite all of my efforts, so I was at a loss. I thought about it for a long time, did some research, and decided to take a different approach this time. During my research on mini pig behavior, I came across an article on Spoiled Pig Syndrome (SPS) that caught my attention. I knew about SPS, but I never really took it seriously until now. Oscar had all of the signs of SPS: grouchy, screaming, biting, charging, snapping, and head swiping, What I learned was really hard to take in and accept. When pigs are spoiled, they don’t respect their humans. They essentially treat their humans as lower-ranking herd members and will swiftly and sternly correct the lower-ranking members for not following their orders. As hard as this was to hear, I knew it was true. I was not the herd leader and, since Oscar didn’t respect me, he was correcting me for doing things he didn’t like, such as not feeding him when he wanted, moving him during his naps, and bringing him inside when he wanted to stay out and root longer. This is where pig parenting gets really hard for me. I’m not a dominant personality, and I don’t enjoy having to assert myself in order to be Oscar’s herd leader. It feels unnatural, and I much prefer the answer to his problems to be more love and play and treats. But, he’s a pig, and that’s not how he functions. So, while my approach of more attention and affection might work well for a dog, it actually makes Oscar’s behavior worse and everyone in the house more miserable. This has been really difficult to accept because it feels counterintuitive, but I’m learning that it’s necessary in order to live a happy, content life with Oscar. So, Monday afternoon I set some new rules as a kind of mini pig behavior boot camp. Oscar has to earn all of his food, so no treats without doing a circle or other trick first and his meals will come from his Bob-A-Lot so that he works for them. He will also eat at 8 am and 4:30 pm, no earlier even if he’s upset. Everyone needs to Move the Pig a few times a day and never step over or around him. Oscar will continue to get plenty of rooting and outside time to keep his rooting needs satisfied. Here’s the big one for us: no more playing with feet. I have always let Oscar play with feet and shoes because I thought it was cute and innocent, but the feet are where he’s really showing aggression lately. He has been charging and nipping at feet, and I found a really useful article that suggests that allowing them to do this gives the pig dominance and can cause hierarchy problems. After less than a week of the new rules, I feel like have a completely different pig. He’s sweet again and has growled a few times but hasn’t even tried to nip or bite. I can lay down on the floor and get close to him without any negative behaviors. He is no longer charging at our feet when we try to bring him in or take him somewhere on the leash where he doesn’t want to go. Things aren’t perfect and he still growls some when we try to move him after a nap, but I can barely believe the changes I’ve seen in him this week. I went from crying and wondering how I was going to handle him to enjoying being around him and having my sweet pig back. Best of all, despite what feels like more harsh rules and behavior toward him, Oscar seems happier and more relaxed. He seems comfortable knowing his place and isn’t bothered by his lower position in the hierarchy. I know this isn’t a permanent change because we go through these cycles with Oscar’s behavior. I will get busy and forget to move him and keep up with the new rules, and he will start to challenge for hierarchy again. But, it’s important for me to remember the pig that he can be when I’m acting as the leader. Although it feels more natural to shower him with love and affection when he’s grumpy, I need to remember that he functions differently and that hierarchy is very real to him. In order for him to be the best pet he can be, he needs love and affection, but he also needs a leader with structure and rules. Owning a pet pig can be really challenging at times. With my dog, I never think about hierarchy or moving her or any of these mind games that I feel I have to play with Oscar. 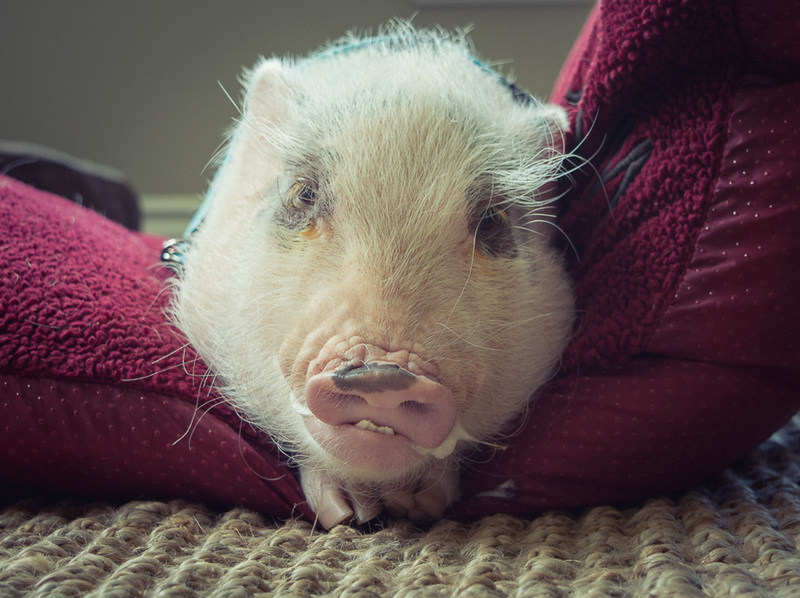 But, these are the challenges of life with a mini pig, and they truly can be the difference between having a spoiled pig who runs the home or a sweet pig who respects her family. 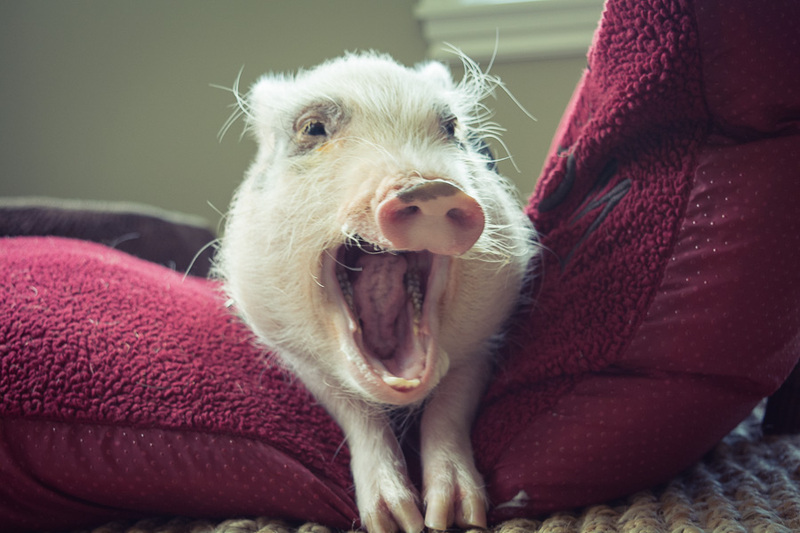 A spoiled mini pig is not fun for anyone; they are typically aggressive, grouchy, and just unpleasant to be around. Fortunately, there is real hope. I am amazed at the changes I have seen in Oscar in just a week and hope to implement these new rules as part of our daily life to avoid future SPS issues. 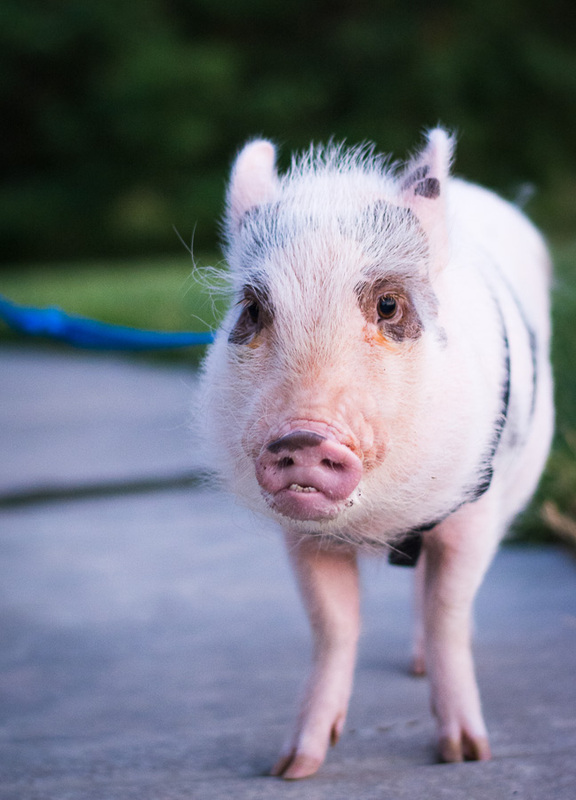 In case you’re struggling with Spoiled Pig Syndrome and some of the same behavior issues we’ve experienced recently with Oscar, I’ve listed below a few of the articles I found most useful in creating Oscar’s new rules. 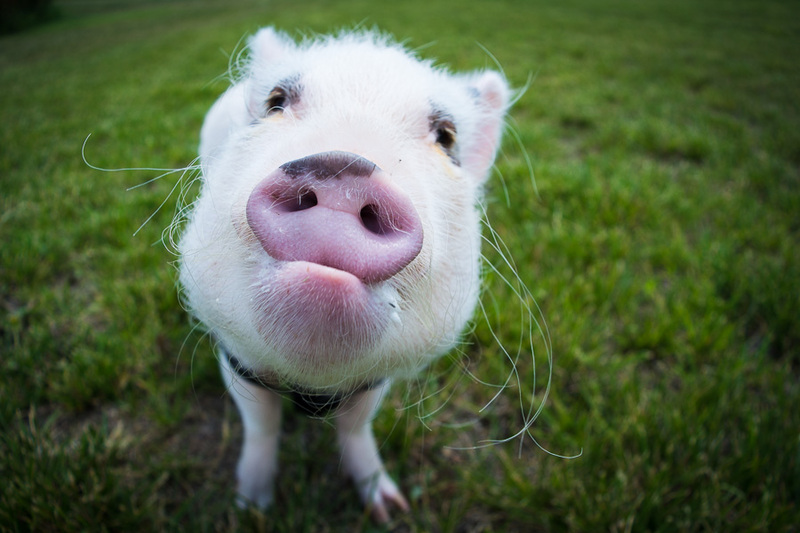 Mini Pig Facts – Spoiled Pig Syndrome: This article gives a good explanation of the “ladder” that pigs live by and also gives some ideas for dealing with SPS. My favorite part about this article is the discussion about not letting pigs play with feet. Not allowing Oscar to play with feet has caused a huge positive change in his behavior. 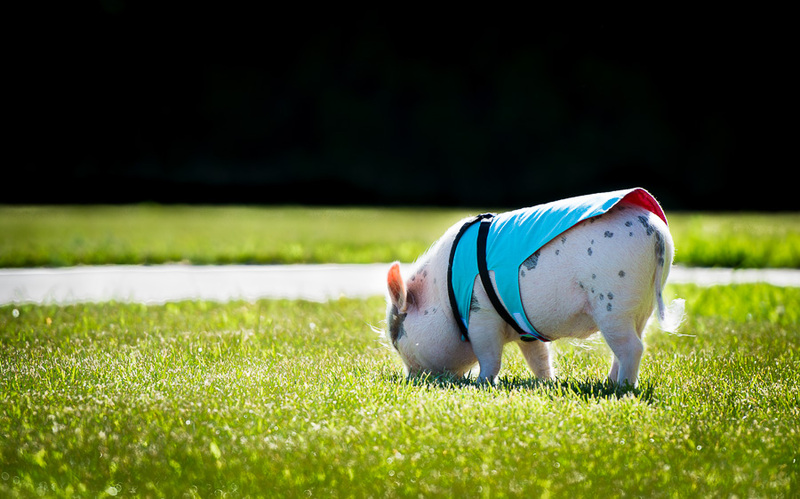 American Mini Pig Association – Spoiled Pig Syndrome (SPS) in Mini Pigs: This article is where I learned a ton of general information about SPS and, in particular, was helpful in “diagnosing” Oscar through their list of SPS signs. Great blog!!! It’s all about the heirarchy! Alwayssss !! Good work mama!!! Once again, Oscar and Piper seem to be in sync — we’ve been having the same issues with her as you have with him. I’m glad you posted about this! Thanks for reminding me that we need to Move the Pig and use her Kong for her pig chow. Fingers crossed! It’s a good thing our pigs are so cute! Oh no, and he was being such a good boy at grandma’s. It’s disheartening when they swipe at you for no apparent reason, but there must be a reason, but we don’t necessarily know why. Elmer nipped at my toes yesterday for some reason. I was like, “excuse you!” haha, and he knew I was mad at him for doing that ’cause he ran away. I walked behind him and made sure to keep him moving and then told him to go lay down, which he did, then I moved him again. He knows when he’s done something wrong. I don’t understand why he sometimes does things that he knows will make me mad at him. I too get lax in MTP because they go through periods of being so well-behaved that you think you don’t need to do it anymore. Nope. I guess if they see an opportunity to be top pig, they’ll take it, and we just have to put them back in line. I think disheartening is a great word for it. I think it’s awesome that you followed Elmer around and moved him after he nipped at your toes. I’ve found that MTP is an excellent way for me to vent my frustration when Oscar nips or head swipes. Instead of just getting mad or yelling or something less productive, I just move him and know that’s actually addressing the issue rather than making things worse between us. I think you’re 100% right about them taking any opportunity to be top pig. I imagine that they are constantly living in this world of hierarchy, while we pop in and out and remember and then forget. Then, when I’m not thinking about it, Oscar seems to take the little moments of opportunity to push his way back up the ladder. Before I know it, he’s displaying the SPS symptoms that seem out of nowhere to me but have probably been slowly progressing for a while when I wasn’t paying attention. Oh my goodness…I can definitely relate to not being able to stay angry! That’s so sweet that Elmer goes to you to snuggle after he’s been in trouble. 🙂 Oscar is the sweetest pig in the whole world after he’s done something wrong. There’s no way to stay angry when they do that…haha! Great blog! This helps me out so much cause I thought Maggie was going to be stuck like this forever! I read a couple things on it before I found this and realized I should be only giving her treats when she deserves them and that’s really working. But she just roots on me all the time, my feet, my legs, my pants and I don’t know how to stop it. I didn’t know if it was because I was her mom and that’s what pigs do to their mom so I need to read that article on how to stop playing with feet. Thank you so much! Thank you! I’m so glad the blog post helped! One thing I’ve learned is that dealing with Oscar’s SPS is likely going to be lifelong, and I’m slowly learning to interact with him differently. It’s now just second nature to me to move him when he’s in my way instead of stepping over him like I used to do, so some of those behaviors are getting easier and easier to keep up on, which makes him a better pet. Keeping him from playing with our feet has really been a positive change, although it was a tough one to break because I kind of liked when he noodled on my toes. Hi Danna! Thanks for sharing Axel’s picture on Oscar’s Facebook page. Axel is adorable! My best advice for this is to familiarize yourself with Move the Pig (MTP) if you haven’t already. Even if you’re not ready to use MTP on Axel, the theories behind why it’s used helps to understand how pigs think and how pigs respond naturally to other pigs. It’s pretty fascinating and has definitely changed how I relate to Oscar. I think the main reason Oscar has SPS is that I haven’t always been very firm with him (I just want to love on him). After learning about MTP, I’ve been able to better balance loving him with giving him rules and being more firm with his behavior, which seems to keep him more in check. We still deal with the stubborn behaviors and some head swiping (although I’m glad Axel hasn’t done that yet…), but I feel like Oscar’s behavior is under control and that I know how to handle those negative behaviors in a way that’s productive and meaningful to him. So, I know Axel’s behavior hasn’t escalated to the point where MTP is absolutely necessary, but it’s a good tool to understand and to start using before he starts any of the biting or head swiping. I’ll put the link to our MTP post below, and it also has links to other articles about MTP that I found most helpful and easy to understand. I hope that helps! I have a 3 mth old female pot belly. We are In. Process of learning her the word NO and of course it is not going so well. Any suggestions on making her behave. I have moved the kitchen trash can to the other side of the gate so she doesn’t knock it over but there is one In living room that is much easier to clean up if she doesn’t listen and I cant get to her quick enough.